Jimmy had a day off work yesterday. I was just heading off to town to look for an outfit for Julies daughter’s wedding when he follows me out to the car. ‘I’ll come with you Bernie’ he said. I hate when he comes shopping with me. He spends the whole time moaning and giving out about the length of time I spend in the shops. ‘Are you sure Jimmy?’ I said. ‘Would you not prefer to do a bit of gardening or relax in front of the telly? I’ll only be an hour?’ ‘Ah no, I’ll come with you love’ says he. ‘It’ll be nice’ There was no getting away from him. ‘Come on then’ I said. ‘But you better not start annoying me to hurry up’. ‘Sure you’ll only be an hour’ he said. Well, when we got home that afternoon he was in a right mood. When was I only ever an hour out shopping? Sure who’ll be looking at you? I’ll just wear me apron and slippers then will I Jimmy? Just because you’re happy wearing the same suit to every wedding and party we go to, doesn’t mean I have to. Too right I’m getting me moneys worth.I bought that in Burton’s, it wasn’t cheap you know. I know, you tell me that every time you wear it Jimmy. You were so. The security guard was giving me funny looks I was so long standing there. Four feckin’ hours traipsing around town and you saw nothing you liked? Tomorrow? Again? Are you off your trolly? What makes you think you’ll see anything you like tomorrow if you couldn’t see anything today? Spend more than four hours?Well, you’re on your own. He is NEVER coming shopping with me again! Heeheehee! Hope you got some shopping done in peace! Did ya even get the knickers?! I did indeed. A 6 pack of black hipsters in Penneys and a couple of lacy thongs in Ann summers 😉. I don’t even know Penneys (maybe we don’t have it in the UK). Oo lala! I’ve never had a pair of knickers from Ann Summers, how innocent! Ah now that makes more sense, primark don’t always fit me too well. Haha! No no thongs are great, even if they are not really meant for men it doesn’t stop me. My favourite type of knickers. Haha, g’wan ye good thing!! Haha why am I a good thing? 😆 I like that phrase! Haha sadly it’s a boxers day today, not knickers 😦 I needed that egging on earlier! Now that one I certainly don’t know, it’s like another language! 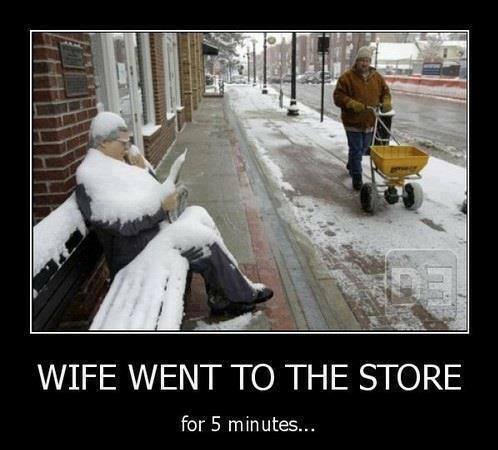 Do all husbands have this same shopping gene? Read this to my husband on the way to the Lady GaGa concert. We’re both dying. Thanks for the laughs. My husband’s contrary streak comes in handy when I go shopping. He’s so sure he can find whatever I want better and cheaper that I just tell him what I’m after and turn him loose. Sure enough, he finds it better and cheaper. I’m happy with the item, he gets to be right, and all’s well!